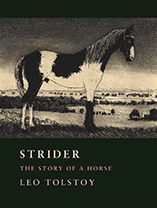 Known worldwide for his masterpieces Anna Karenina and War and Peace, Leo Tolstoy takes a less dramatic but no less poignant approach in Strider: The Story of a Horse. Told from Strider’s own aged, equine perspective, the tale nonetheless addresses such perennial human concerns as prejudice, fortune, and mortality. Tolstoy subtly illustrates the parallels and contrasts between horse and human, as we see through Strider’s eyes the decline of his most memorable owner—a rich, arrogant hussar officer in his youth and a depleted, decrepit figure in his dotage. Completed in Tolstoy’s own old age, Strider offers a compelling glimpse into the author’s growing obsession with mortality. Published in 1885, the story idea first occurred to Tolstoy in 1856 and thus spans the two main periods of his writing career. Strider, of interest to general readers and students of Russian literature alike, offers considerably more than simply a story of a horse.